Complete Kitchen and Hood Cleaning and Fire Protection Services. 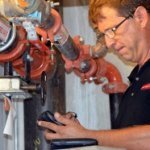 Cheyenne, WY – Fire sprinkler systems are often hard to maintain and are easy to forget about, but making sure that they are kept in good repair all year long is important. In fires where sprinkler systems failed, 69% of them were due to water not reaching the fire. Here are 6 Tips to make sure that your fire sprinkler system is in good shape year round. Make sure that the water flow is on. This may seem obvious, but if your place of business catches fire and your sprinkler system valves are closed, they won’t do you a bit of good. In this report from the NFPA, they reported that in 50% of fires the sprinkler system failure was due to “system shut off.” Make sure after any maintenance or inspection is done, that the valves are open so that your system is operational. Make sure that you never paint over the sprinkler system. Sprinkler systems are not the most decorative things in your restaurant or business, and they really aren’t meant to be. They are meant to be functional. While it might be tempting to paint them to blend in with your ceiling, it could block to flow of water and prevent them from serving their purpose. Don’t block the sprinklers. Storage space in restaurants can be limited, and it’s easy to fill any space just to maximize storage. Just make sure that when you are stacking things, you are not blocking the fire suppression system. Your sprinklers can’t do their job if something is obstructing their way. Make sure there is no corrosion or build-up on the sprinkler head. Similar to painting, corrosion or build up of any kind will keep the sprinkler system from working to its full ability. Periodically check the sprinklers to make sure they are clear of anything that might block the water flow. Don’t let it your wet pipe sprinkler system freeze. In an attempt to save money, it can be tempting to turn the heat down when the building is empty. No one will be there to be bothered, right? The problem is that the sprinkler system using wet pipes can freeze, keeping water from flowing through. Make sure that your building is kept at a temperature at least high enough to prevent freezing. Don’t hang things from the sprinkler system. Sometimes it seems really convenient to use your fire suppression sprinklers as mounting anchors. However, these systems are not designed to hold any sort of weight. Hanging things from sprinkler heads can cause bending and breaking. Plus, they may further block the water from reaching its target. Making sure that your fire suppression system is fully operational is just as important as reducing your risk of having a fire. To avoid one of the top causes of fires in your restaurant, make sure to get your vent hoods cleaned out regularly by professionals in restaurant hood repair like Wyoming based APS-Hoods. With fire system installations and semi-annual inspections, we guarantee everything is built and installed in a manner that promotes safety, efficiency, and longevity of the equipment in your commercial kitchen. For more information about cleaning services or fire suppression services, contact APS-Hoods for a free estimate at (800) 750-7313 in Denver Colorado, Los Angeles & Orange County California, and elsewhere around the country. © 2018 Millionairium and Farazandeh. Authorization to post is granted, with the stipulation that Millionairium and Farazandeh are credited as sole source. Linking to other sites from this document is strictly prohibited, with the exception of herein imbedded links.